This site is dedicated to the 1963 Dodge, a vehicle that seems to be left out of most of the publications and all of the parts stores. Information seems to be difficult to find regarding the 1963 Dodge, whether it's because nobody knows or nobody cares I don't know but here goes. There are a lot of large images on some of the pages but if you are interested enough you will wait for them. Most of the pages have a "Back" button and a "Next" button. These should take you to the last or next page in the sequence. Open the window to full screen as well and if you have your monitor set to 600 x 800 pixels it might not screw up the tables. 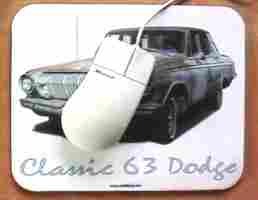 Who wants a 1963 Dodge Mousepad ??? or any other member of their corporate structure. MoPar® is a registered trademark of the Chrysler Motors Corporation.